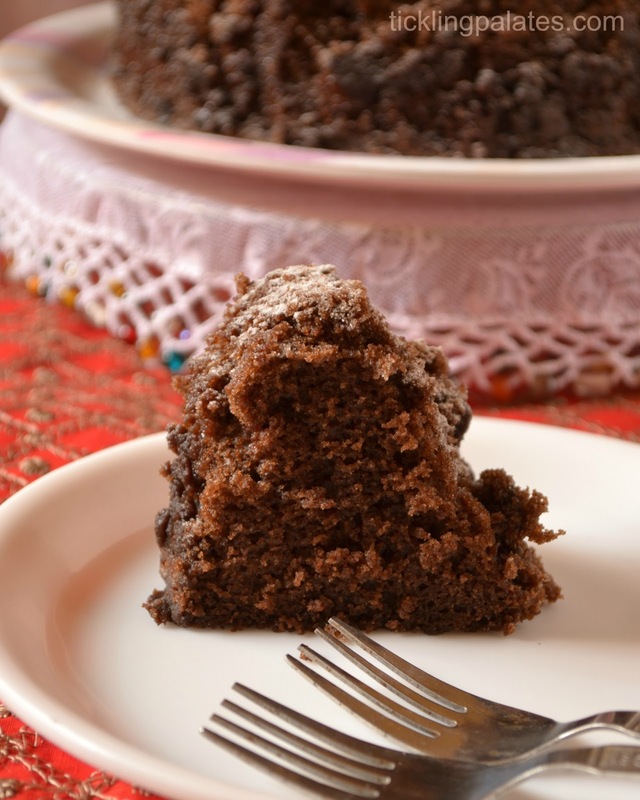 I love a good homey chocolate cake. It would be even better if I can rustle it up in a jiffy, one that does not require a whole lot of pots and pans which means a lot of cleaning up after the eating is done, one that takes only one bowl for the entire thing…. Too much to ask for right. But that is exactly what I made when I tweaked this One bowl Vanilla cupcake recipe into a full fledged bundt cake. 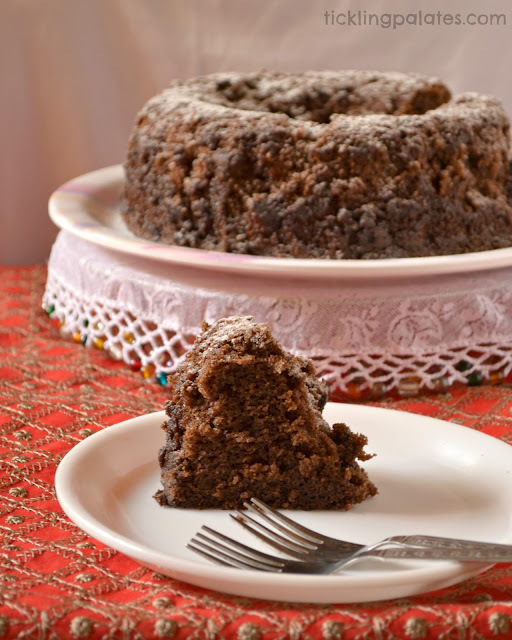 I had promised the kids a bundt cake a month and got a good chance to bake one when Veena gave me Yogurt as the secret ingredient for this month Hush Hush week for the Avant Garde Cookies Group. Also I wanted to flaunt the lace food cover which was a gifted by my vivacious FB friend Prachi Agarwal and what better chance than to display this cake on it. Isn’t it beautiful? I just can’t thank her enough for such a thoughtful and beautiful gift. 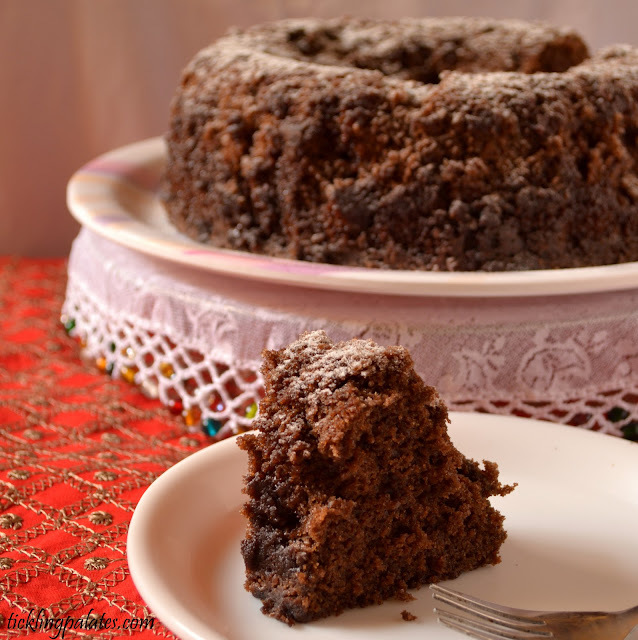 If you are looking out for an everyday, to go chocolate cake recipe this one might just be for you. As I did not have butter at hand, I greased the pan with just oil and dusted it with flour and that resulted in a crumbly surface after I inverted the cake. So I urge you to use butter for greasing. 1.Pre heat the oven @ 180 C / 350 F. Grease and dust a bundt pan and keep it ready. 2. In a large mixing bowl add flour, cocoa powder, baking powder, baking soda, both the sugars and whisk using a hand mixer till mixed well. 3. Add the eggs, yogurt/curd, vegetable oil and beat well for 3-4 minutes. 4. Add vanilla eseence and beat just once for the flavor to get mixed into the batter. 5. Finally in a small bowl dust the chocolate chips with 1 tsp of flour and add it to the batter and mix in with a spatula. 6. Pour the batter into the pan and bake for 50-55 minutes or till a skewer inserted comes out clean. 7. Take the pan out and let the cake cool in the pan for 10 minutes. Invert onto a wire rack and let it cool to room temperature. Dust the top with powdered or Icing sugar (optional). 8. Enjoy with your favorite cup. Personally both the kids and Hubby felt that the cake tasted much better the next day. 1. 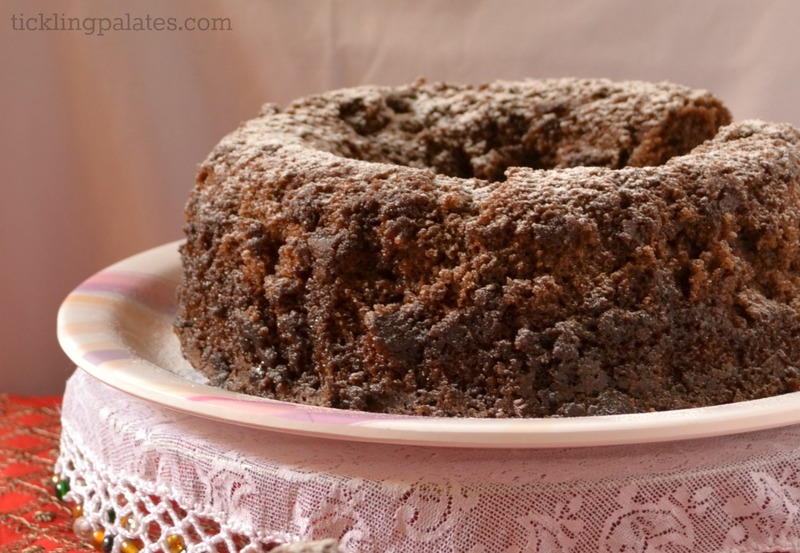 You can use whole wheat flour but the baking time would differ and also the cake will be a bit dense. 2. You can just go with either white or brown sugar instead of using both the sugars. 3. Make sure that the eggs and yogurt are at room temperature. 4. I used chocolate chips for an intense chocolaty flavor and you can skip if you do not have at hand. This if off to Avant Garde Cookies and do not forget to check out other cookies Anusha, Jayanthi,Kavi, Priya, Priya Mahadevan, Roshni and Veena for what they rustle up with their secret ingredients. This looks too good. I am not much of a baker, but recipes like these definitely want me to try. Book marking it. Thanks for sharing. Simply stunning looking cake. Excellent preparation. cake is tempting and yummy yum! Very attractive and super tempting cake..
I’m grabbing the one piece and running away now! Irresistible cake dear!!! Yummy.My daughter like to eat chocolate cakes I would try this recipe in the week end. Thank you for the feedback Aswathi. So happy to hear that you liked it. Is that unsweetened cocoa powdered or sweetened? Hi Kathy, It is unsweetened cocoa powder. do let me know how it turns out for you after trying.